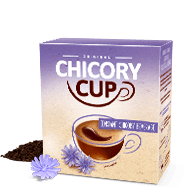 Chicorycup is a brand of beverages made from roasted chicory root. 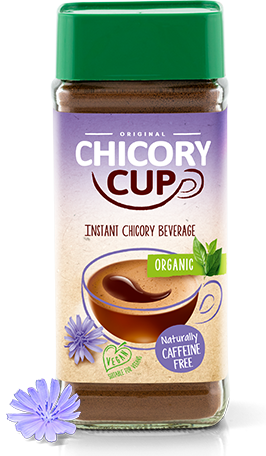 For hundreds of years infusions of chicory have been known and appreciated on different continents as a nutritional and valuable drink as an alternative to coffee, tea and cocoa. Chicory looks like an ordinary plant in appearance. It is most commonly found as a wild plant on roadsides and pastures. Besides naturally occurring wild varieties, seed varieties are also cultivated. The leaves and roots of this plant have medicinal properties, and have therefore been long used in folk medicine. The roots are also appreciated nowadays as they contain inulin. After roasting, chicory roots have a very interesting taste and flavour, similar to natural coffee. Grana is the Polish producer of chicory beverages. The traditions of roasting and processing this plant in our company reaches back to 1911. The products in both their roasted and ground form as well as their currently most popular form on the market - soluble chicory - are based on traditional recipes that have been perfected over the years. 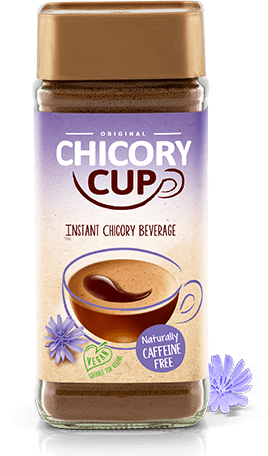 Instant drinks made of roasted chicory root. 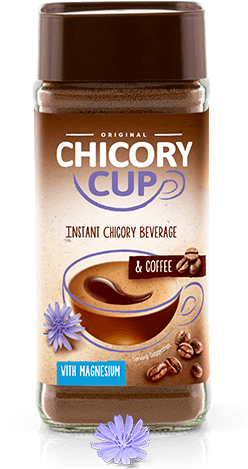 Made from only roasted chicory root, with its wonderful aroma and delicious coffee-like flavour, Chicorycup can be enjoyed all day long. It’s also a rich source of fibre and easy to prepare. 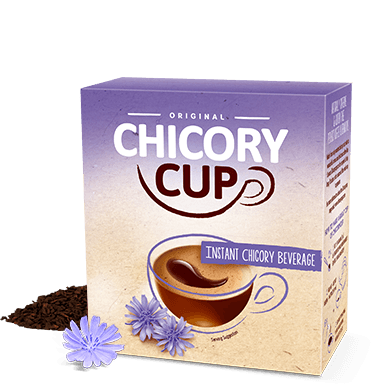 Chicorycup is produced from the highest quality ingredients - chicory root. Chicorycup is made naturally by first roasting the ingredients then followed by water extraction. This way the most valuable liquid essence is obtained. The final step of production is drying to obtain a soluble powder. That’s how Chicorycup becomes a quick and easy-to-prepare chicory beverage. Put 2 teaspoons (3 g) of Chicorycup into a cup and add hot (but not boiling) water and stir. Add milk or sugar to taste. Chicorycup Organic is produced from the highest quality ingredients that come from certified organic cultivations. Chicorycup is made naturally by first roasting the ingredients then followed by water extraction. This way the most valuable liquid essence is obtained. The final step of production is drying to obtain a soluble powder. That’s how Chicorycup becomes a quick and easy-to-prepare chicory beverage. 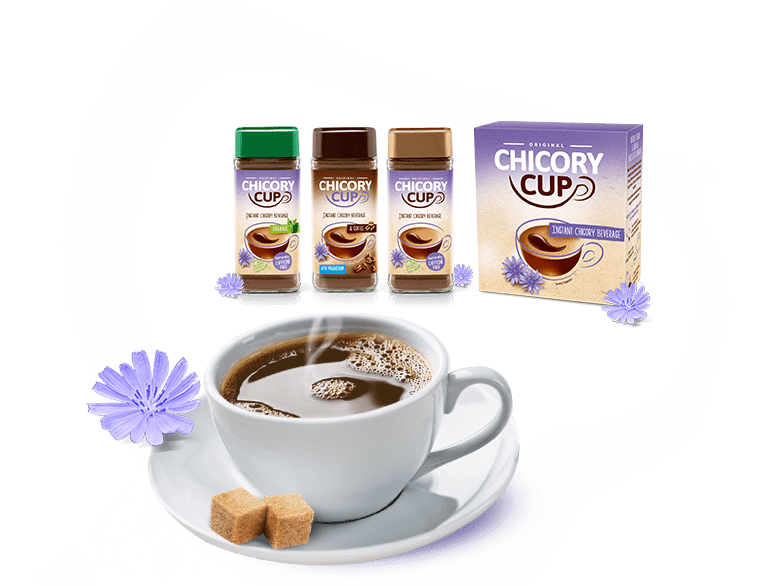 Chicorycup with Coffee and Magnesium delivers a winning flavour combination of good, strong coffee with a hint of chicory that can be enjoyed at any time of the day. The beverage is a source of magnesium. 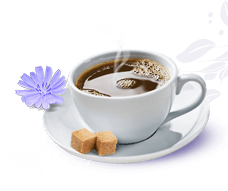 This easy-to-prepare soluble product retains all the taste of coffee and chicory. Put 3 teaspoons (5 g) of Chicorycup into a cup and add hot (but not boiling) water and stir. Add milk or sugar to taste. Roasted ground Chicorycup - a traditional recipe, a delicate taste and aroma from roasted chicory. Ground Chicorycup retains the properties of the chicory root. 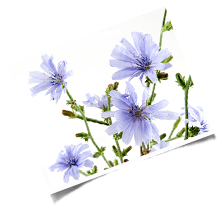 We only use chicory from European agriculture in our production process. Chicorycup ground is ideal for brewing. 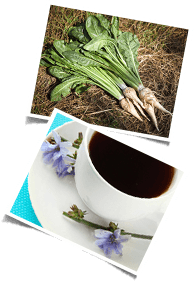 Put 1 teaspoon (4 g) of chicory per cup (200 ml) into a coffee maker and add boiling water. You can also create your own, perfect blend of coffee and brew it traditionally or in a coffee maker. The data will be stored for the period necessary for handling the case. After this term, GRANA may also store your personal data for the period during which it is necessary due to its obligations related to documentation archiving (in such a case, data shall be processed for the purpose of the data controller's legitimate interest, namely to meet its obligations towards state authorities). You have a right to require that GRANA give you access to your personal data, to have the data rectified, deleted or processing restricted. You also have a right to object to the processing and transfer of your data. You are also entitled to lodge a complaint with a supervisory authority in relation to the processing of your personal data.